Along the Namibian coast the nutrient-rich cold Benguela Current and its upwelling system in the Atlantic Ocean supports a vibrant fishing industry. Namibia’s fishing grounds is one of the most productive and stretches along the total coastline of 1,570 km and 200 nautical miles westwards into the sea. More than 20 species of fish, lobsters and crabs are commercially harvested in these waters. The fishing industry is the third largest economic sector contributed about 6.6 percent cent to the Gross Domestic Product (GDP). The value of fishing, onshore and offshore processing accounted for N$3,410 million in 2008. It is also the largest employer at the coast. The industry at Walvis Bay, and Lüderitz in the Karas Region, employs about 14,000 workers, of which about 43 percent work on vessels at sea while 57 percent are involved in onshore processing. Namibia’s fishing industry is the country’s second biggest export earner of foreign currency after mining. In total of 90 percent of the national output is exported. 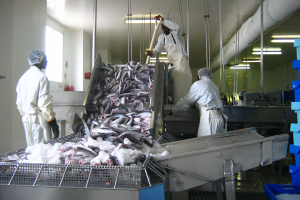 Globally, Namibia ranks among the top ten fishing countries in terms of the value of production, and in terms of its 400 kg per capita annual production, Namibia ranks second in the world. Namibia is also the top African fisheries country by production value and exports and her estimated national fish reserves are the biggest in Southern Africa. However, the fishing industry and the Namibian economy faced some challenges in recent years. The Pilchard (Sardine) industry totally collapsed due to alleged over-fishing and natural events such as the Benguela-Nino in 1984/85 and 1994/1995 (from: Namibia’s Coast Ocean Riches and Desert Treasures). Therefore Namibia’s has to take care of this renewable and living resource. The Ministry of Fisheries and Marine Resources issues rights of exploitation, fishing vessel licenses, and in some fisheries, TACs and individual catch quotas. Mariculture has become another sustainable way of creating employment and increase economic growth. This includes the cultivation of oysters in the sheltered Walvis Bay as well as ponds north of Swakopmund. Namibian oysters have become a sought-after, locally and abroad.